In recognition of National Public Safety Telecommunications Week (NPSTW) April 14-20, 2019 we salute the dedicated men and women of the Westchester County Department of Emergency Services Emergency Communications Center [60-Control]. The ECC provides full time dispatch services to 52 of the Fire agencies and 31 of the EMS agencies in the county. These vital services are provided 24/7 by a group of well-trained and dedicated team members that answers emergency phone requests, dispatch local fire and EMS agencies and provide needed logistics to agencies in need. 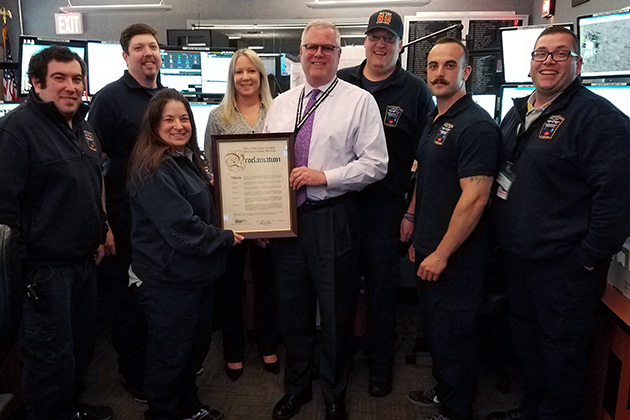 On Wednesday April 17, 2019 Emergency Services Commissioner John M. Cullen presented the staff with a proclamation on behalf of County Executive George Latimer. The proclamation recognized and honored the work and dedication of the Emergency Communications Center team in protection lives and property. Often the ECC team works behind the scenes as the “first” First Responders in helping collect critical information and dispatch the most appropriate services to handle an emergency or event. Photo (Left to right )Communications Operator Matthew DiPrinzio, Communications Operator Dennis Reilly, Senior Communications Operator Alison Berlow, Quality Assurance Coordinator Sabrina Abbot, Commissioner John M. Cullen, Communications Operator Robert Bancroft, Communications Operator Derek Grisanti and Captain John Munson.